This Demonstration plots in the interval as well as the function's polynomial interpolation for equally spaced points and for the Chebyshev–Lobatto points. 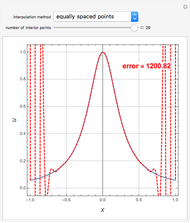 You can change the degree of interpolation or the number of interior interpolation points, . 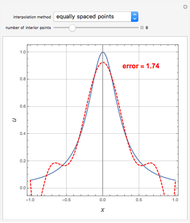 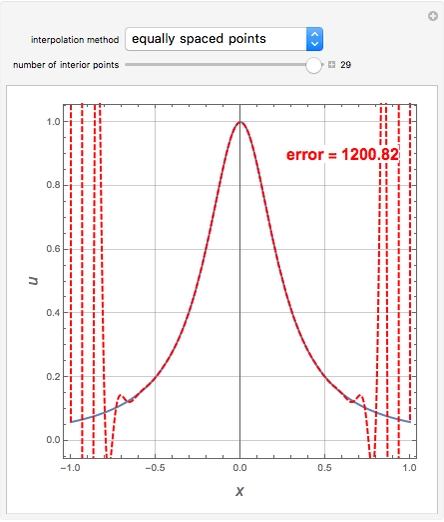 As gets larger, the error (computed as the norm of vector with varying from to with a spacing of 0.005), displayed with the red text in the figure, decreases exponentially for the Chebyshev–Lobatto points, while the same computed error increases exponentially in the equispaced case. 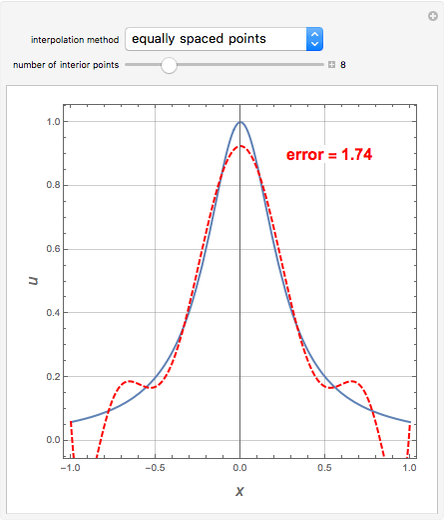 This behavior is known as the Runge phenomenon. Housam Binous, Brian G. Higgins, and Ahmed Bellagi "Polynomial Interpolation Using Equispaced versus Chebyshev-Lobatto Points"